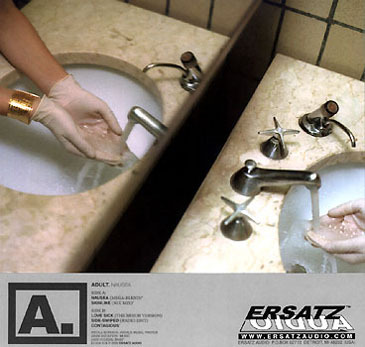 ©2000 ERSATZ AUDIO. Published by Ersatz Music, ASCAP. After much success with their previous release "New-Phonies" on the Dutch label CLONE Records, ADULT. 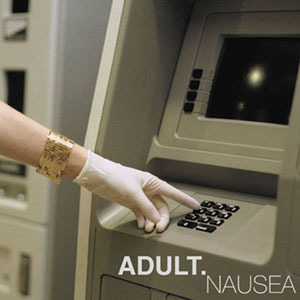 returns home to their Detroit imprint ERSATZ AUDIO with a brand new 5 song mini LP entitled "Nausea". More than a simple dance 12", "NAUSEA" comes as a complete concept package, thus meriting mini LP status. This release contains 5 upbeat adrenaline-filled songs fusing a numbing combination and knowledge of the vocabulary used in electronic dance music. Sing along to addictive melodies with songs about Haptephobia, Philophobia and Tapinophobia. Extended metaphors about Misophobia become all to familiar comparisons to failed relationships and missed opportunities. But fear not, ADULT. has not developed a compulsion for Melophobia or Chorophobia. These 5 tracks open up from full melodic explosions to near noise classification and renewed 4/4 rhythms . Unique uses of live bass guitar in 3 of the 5 tracks enforce that ADULT. does not fear everything. So clean your turntable and needle, and prepare to feel the power of "NAUSEA".